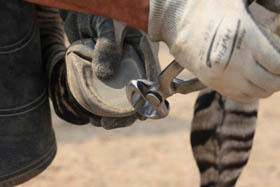 Ross’ farrier practice is focused on the unique hoof care needs of donkeys and mules. Ross is certified by the Equine Lameness Prevention Organization (E.L.P.O) and is an accredited member of the American Association of Professional Farriers (AAPF). 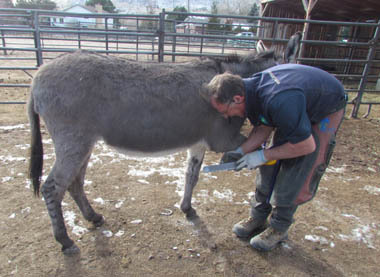 Ross has extensive experience in the unique hoof care, behavioral, and handling needs of donkeys and mules. Donkey and mule hooves are very different from horses and their proper care is the critical foundation on which their health, happiness, and fitness are built. 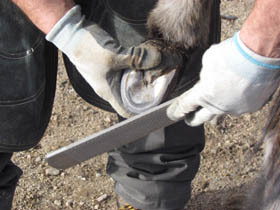 Ross has developed practices and procedures that address the unique form and function of the donkey hoof. He also is an expert in addressing hoof distortion and other problems unique to the long-ear hoof. Ross presented at the UC Davis Donkey Symposium in 2015 and the E.L.P.O. International Lameness Conference in 2017. First and foremost, Ross works with your equine to gain their trust. We take a quiet and confident approach to your animal and believe that all work should be performed with as little restraint as possible. If there is an underlying behavior or training issue, it is addressed as part of the hoof care program. Once we have an established hoof care program, you and your equine will enjoy the visit and be satisfied with the results.